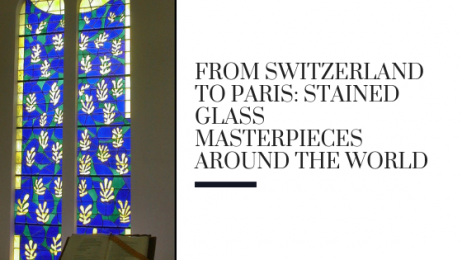 Due to our passion for stained glass, we’re always looking for stained glass masterpieces from around the world to draw inspiration from or just to simply admire. The world is filled with exceptional stained glass collections that are typically featured throughout various houses of worship. For those stained glass enthusiasts and art lovers, here are some of the more noteworthy stained glass windows we love. The maintenance of leaded glass is very necessary to prevent more serious problems like total failure and loss of the windows. The frame is the most essential part of any stained glass window to keep maintained regardless of the material. Sometimes this is simply doing a regular painting and caulking, and an occasional replacement of the glazing compound. Wood frames and masonry frames must be kept painted and caulked to prevent moisture from corroding the steel armature and anchors that may be within. If your Florrisant stained glass windows leak water, are draughty, or rattle this may indicate that the waterproofing cement (“waterproofing”) and sealants have deteriorated and professional maintenance or restoration is needed. This involves glazing and sealants (e.g., putties, caulks) used to seal the leaded panel and any open joints around the window frame. However, since leaded glass cannot be adequately waterproofed in place, you will need to call in a professional, like Kansas City Stained glass to remove the affected windows and perform maintenance on the surrounding windows to secure and reinforce. Catching this sort of maintenance early is much less expensive than waiting for the leading to deteriorate and then need to relead the entire window. So, if there is any question in your mind, it is best to have a stained glass window inspection on your Florrisant church and act quickly and fully on the needed repairs. At Kansas City Stained Glass, we are the experts in stained glass window repairs and restorations; not just here in the Kansas and Missouri area but across the United States. For more information or to get pricing on much-needed repairs to your antique church glass, contact us today! Stained glass windows may seem like a luxury but they are actually more accessible to homeowners with a real-life budget than ever before. This is because today ’s stained glass windows come in a variety of different shapes, sizes and designs and price points–any of which can be made to match your budget. A popular trend driving the accessibility of these windows are stained glass panel inserts. Simple, stunning and made to order–these panels make an elegant home design in Kansas City to be well within your reach. What Are Stained Glass Panel Inserts? How Are Stained Glass Panel Inserts Installed? As mentioned, stained glass panels are manufactured ahead of time by our expert craftsmen but are simply “popped” in by our installation experts. The whole process is fast–done in as little as an hour if not minutes and clean. Essentially our your installer thoroughly washes and dries the pre-made stained glass insert, test fits it and then adheres it with a bonding tape. These stained glass window inserts will stay firmly in place for years and years to come but may be removed should you move. 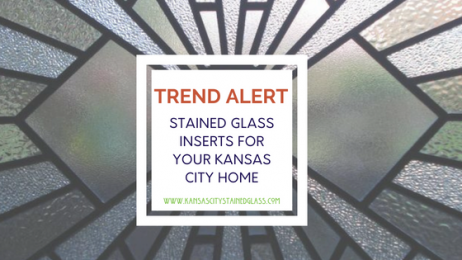 For more information on stained glass inserts for your Kansas City home, contact us at Kansas City Stained Glass today! One of the styles of stained glass that we specialize in is prairie style stained glass. 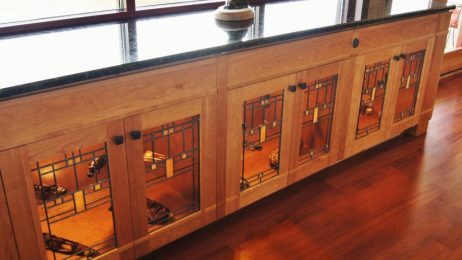 Inspired by the works of Frank Lloyd Wright, our prairie style stained glass adds beauty to any Kansas City home. Clean lines, simple geometric shapes, and warm earth tones make these stained glass windows elegant and beautiful, which is why they’re one of our most requested stained glass styles. In Kansas City, prairie style stained glass can be seen all throughout the various neighborhoods of the city, in churches, homes, and even commercial buildings. In fact, there are seven original Frank Lloyd Wright buildings in Kansas and Missouri, which is probably a good reason why the style has maintained popularity over the years. 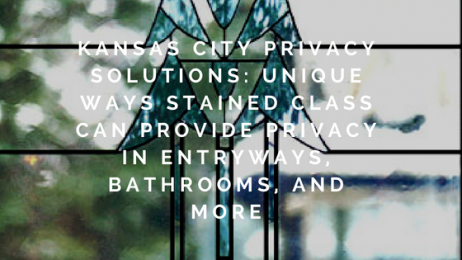 Kansas City residents may experience privacy issues at their place of residence. This often causes major discomfort, making finding an effective solution top priority. Many privacy solutions have serious downsides like blocking out natural light, looking tacky or outdated, creating an unwelcoming space, not complimenting the rest of your homes decor, and much more. Fortuitously, stained glass presents a permanent solution that boasts beauty and high performance. If you haven’t heard of Charles Rennie Mackintosh, you still would likely recognize his stylings. His influence is all around us in art and architecture today and characterized by his signature minimalistic style. He was a prolific designer, artist, architect and furniture builder who attended the Glasgow School and went on to become one of the most influential figures in stained glass art of his time to present day. 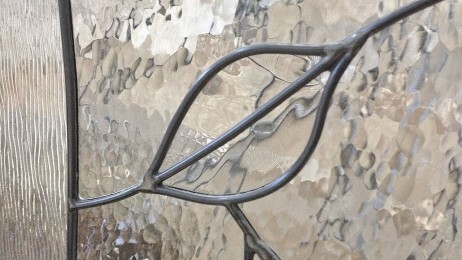 His popular signature stained glass style includes the Mackintosh rose–easily one of his most popular motifs. No one can pinpoint exactly where Mackintosh’s style came from but we do know that the 1890s were a time of great learning and artistic expansion for him. It is around then that he traveled to Italy and then went on to continue his design education. While his style is very different than Italian works of the time, his use and attention to color and romantic Italian themes, like floral patterns show the impact this trip had on his work. However, one would characterize his work as that of modern for his time and is still progressive for today’ world. He was an incredibly influential designer and some people call him the founder of the popular Art Nouveau movement. The most commonly known and often used motifs by Charles Rennie Mackintosh are his signature roses. They are minimal but without sacrificing any beauty. Their wonderful natural curves and simplistic textures set them apart from other floral designs, along with is bold colors against clear glass. They are definitely one of the world’s most recognized stained glass motifs and the very picture of doing more with less. While no studio today can claim to live up to Mackintosh’s design style, we at Stained Glass Kansas City, offer marvelous stained glass windows in the style of Charles Mackintosh which mimic the beauty of his original designs. Our work will leave you with a sense of vintage nostalgia, and will truly bring his style of work to life in your home. Mackintosh’s designs are definitely as relevant today as they were at the turn of the 20th century and beyond and will look amazing on any home old or new. 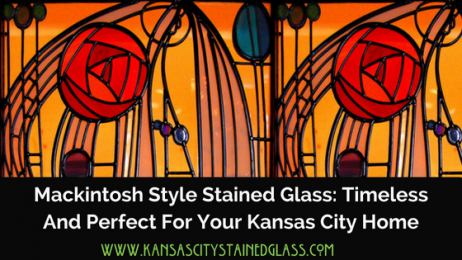 Contact us today to learn more about Mackintosh style glass to beautify your Kansas City home. 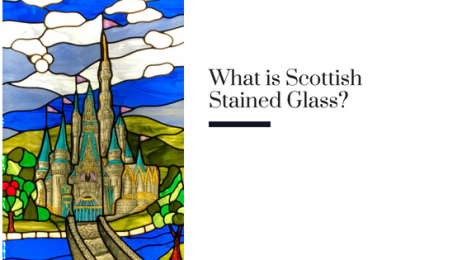 What is Scottish Stained Glass? 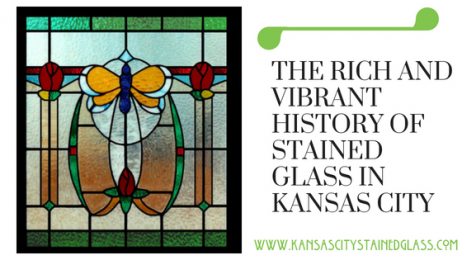 Kansas City Stained Glass is proud to utilize the Scottish Stained Glass process in order to provide Kansas City residential and commercial properties the highest quality custom stained glass available in the United States. Scottish Stained Glass, the industry leader in custom stained glass, is a accredited process that’s been developed over the past 30 years by our founder and president, Martin Faith. Spring has finally sprung, and with the warm weather and sun comes an influx of tourists interested in the historical buildings spread throughout Kansas City. Stained glass art is often a distinctive feature of such buildings. In a past article, we talked about two of the most popular styles common in Kansas City – the immaculately ornate religious facades designed by Tiffany Studios, lead by Louis Comfort Tiffany, and the geometric, minimalist Prairie Style stained glass fashioned by Frank Lloyd Wright. It’s no wonder people come to visit Kansas City and do tours of the architecture. Some of the best features are to see the incredible and valuable works of stained glass artistry. Seven of Wright’s beautiful architectural structures are located in the Kansas-Missouri area, and Kansas City is home to many stained glass beauties hiding in local cathedrals and churches. However, many of these works of art were in fact, crafted by local artisans who largely go unknown today. Why are Glasswork Artisans of the Past Unknown? While Tiffany Studios and Frank Lloyd Wright are household names (and rightfully so), it was not always these design leaders who created the individual pieces of work. In Europe, artisan work was produced in a guild system where craftsmen would not sign the work they produced, but the master of the guild would instead. This practice continued on as people migrated to the United States, leaving the creators a mystery to us today. 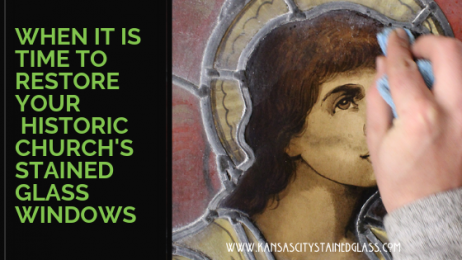 Bruce Mathews is a talented photographer and writer who published his collection of stained glass artwork around this fair city in his book titled Windows of Kansas City. Thanks to his beautiful photography work and exhaustive research, stained glass aficionados can appreciate snippets of history. One such example is Charles J. Andrews, who styled and created dozens of pieces from the 1890’s to 1954. Another is Herman J. Schladermundt, who Mathews found to be the one who produced the Glory of Missouri in Peace windows that can be seen in the state capitol House of Chambers in Jefferson City. It is unfortunate that these artisans and numerous others are not more known throughout the city they are displayed in, but it is quite easy to see why one’s eyes are inevitably drawn to these wondrous, colorful panes of art. Contact us today to talk to an expert who can help you find the perfect stained glass to fit seamlessly into your home. And, don’t forget, we also provide repairs and restorations. Many people have not been exposed to the beauty of stained glass outside of churches. However, stained glass can make a gorgeous accent to any home. 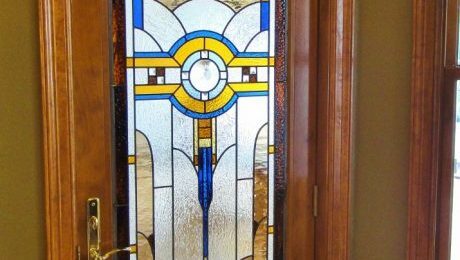 Using custom stained glass, Kansas City homeowners can tailor this beautiful decorative element to their own style and taste while experiencing a number of benefits.